Many years ago, a year or so after Paul was ordained to the ministry, we persuaded our four young children into the van and went to visit old people for the evening. Without the ordaining, I don't think we would have done this, so maybe it's a good thing, but I have become quite disapproving about putting this sort of obligation on ministers with young families. What matters is what happened that one evening. First we went to see "Melvin" and "Hazel." Melvin took Paul into his study and they discussed books. The children and I sat in the living room with Hazel, who sat hunched over with a scowl on her face. I tried to make conversation, which was a losing proposition. Any time one of the children made a move toward any of her many objects, Hazel pointed a bony finger at them and snarled, NO!!" At one point she wanted to show me an old newspaper found in a basket on a nearby shelf. She pointed at Matt. "You! Get me that!" He reached, tentatively, not sure what she meant. "NO!! Not that!! Under it!" The children sat there, wide-eyed and curious and bored. I was nervous and anxious, leaping after any child who reached for any possible thing, hoping to ward off that terrible, angry NO! Finally, Paul mercifully appeared and with great relief we went to visit the next old couple. I'll use their real names: Ralph and Mildred. Ralph hugged us, Mildred hugged us, they smiled and acted just delighted to see us. One of the children plopped into a rocking chair and promptly rocked it back so hard it hit the wall. Still nervous from the ordeal at Hazel's, I leaped over to slow him down. Mildred laughed, "Oh, he's fine! He's not hurting anything!" And that's how the whole evening went. They thought we were wonderful and our children were even wonderfuller. The children played with toys and had fun, but if they touched other things or made too much noise, Ralph and Mildred were still perfectly contented and calm. After we left, Paul and I looked at each other and said, "Let's be like Ralph and Mildred when we get old." We've had guests a lot recently, including a lot of children. Monday night it was two little brothers who ran around the couches and hit each other with that weird reaching mechanical hand that my brother Fred gave the kids. Last night it was a toddler who kept trying to go outside to see the cats. And this evening it was a bunch of little people who spilled popcorn and cried and wrote on my prayer list and poked people with Tinkertoys. It was a great feeling to realize there is nothing especially valuable in my living room and it's perfectly fine if little people bump and rearrange a few things. We haven't had a toddler living here for a long time and it's been fun to have so many here in a short time. The best feeling of all was enjoying the little great-nephews and their high-energy ways, and just having this sense of Mildred Myers's spirit resting on me and her words coming out of my mouth--not in any creepy way, but in that very satisfying sense of finding that all these years later, my wish came true and I was given the grace to be like her. I just hope I can continue to be like her even if I live to be almost 100 like she did. Facebook ad: "What weird rules did YOUR parents have?" Jenny: "Don't pick the tulips!!" "Face it, we are part of a dying industry." That was my friend Bob Welch, last December as we were packing up after the book sale at the Register-Guard building in Eugene, an annual event that the RG generously hosts for its authors. Bob Welch used to write a column three times a week, then he retired from that job and ratcheted up his already prodigious book-writing. He and I and Carolyn Kortge are in a once-a-month rotation as columnists now. Bill Sullivan used to have a regular column in the paper but is now a freelancer. The cooking columnists were laid off. Jan Eliot, writer of the Stone Soup comic strip, has retired. So far, I haven't been cut, but you never know. So after the customers--mostly age 60 and older--left, and the lights were turning off one by one we packed our remaining books in boxes and piled the boxes on our various wheeled haulers and carriers. And then as we were ready to head out into the dark and cold, and Bridget Baker of the newspaper Bakers, one of the few families still running a newspaper in this country, held the door open and told us good night, that's when Bob said we're part of a dying industry. I thought of how a chunk of the RG building is now rented out to other businesses, the definitely-older clientele who still read the newspaper, and the general sense of tightening resources at the Guard. It made me feel sad and old and left behind. Then, in the last week, I've heard from probably three sources that blogging is dead. At least the rambling, storytelling, yammering-about-whatever just-having-fun sort of blogging. A few people still blog, I'm told, but they're all about specific platforms such as decorating or theology or fashion, with well-crafted backgrounds and specific agendas and lots of photos. All the old fun rambly bloggers have moved on, they tell me, first to facebook and then on to Instagram and Twitter and venues I haven't even heard of. That made me feel kind of old and sad and left behind too, as though the young cool people have moved on to the new church up the road where they wave their hands in the air and sing praise songs with a band, and only a few old of us old fogies are still back at the little country church, singing Amazing Grace with a wheezy organ, and they've forgotten all about us. In both these cases I had a brief panicky sense of needing to drop the old and try to catch up with the new before it's too late. I've been writing in some sort of public forum for about 30 years now. All those years, I have heard advice, listened to talks, and read the experts' anxious sermons on The Only Way To Write And Market If You're Going To Reach Any One At All. And I have always gone in the opposite direction. I didn't get a degree in writing, I didn't buy a Writers Market, [that thick expensive writer's Bible] I didn't cycle manuscripts to twenty different periodicals. I was the last one to blog and get on facebook. I didn't advertise. I didn't try to get on radio, TV, or YouTube. I didn't turn my blog into a platform, I didn't have a ladder of ads up the side, and I didn't have a Twitter account. Well, I tried just a few of those, now and then, and soon learned that I was way better off doing it all wrong. I advertised a time or two and barely broke even. Recently I got on Instagram and quickly realized I am not the Instagrammy sort at all because I don't have enough white in my house, I don't travel to dreamy places enough,and I get too jealous of all the cool dreamy travelers with white backgrounds, so I quit following them and just keep up with my kids and their friends. This is what I did do, over the years: I sort of moseyed along and wrote letters to people and raised children and jotted stuff down and mostly met my deadlines. And, if God brought me up to a door, I figured I was supposed to go through it. The successes I've had were mostly surprises. So. Why change my ways now? Newspaper and blogs might be outdated and dying, but I plan to keep on writing for them until God nudges me in another direction. Remember not so long ago when the watchmen up in the crow's nests of the book-industry ship were all warning that ebooks were speedboats overtaking the paper-book industry and all its authors were doomed? There were a lot of nervous authors out there and a lot of fear in the air at writing conferences. Well. This is what has happened: paper books are alive and well, the ebook industry is thriving as well, and authors have more options than they could have dreamed of 15 years ago, more open doors, more volition over their own work, more ways to reach an audience. What isn't very alive or well are the huge monopolizing publishers and bookstores that made it almost impossible for specific-niche and first-time authors to publish their works or to make any money. Newspapers and blogs might be a thing of the past, but words and stories and communication are forever. So. I plan to keep writing about whatever I feel like. And I do appreciate all you old-fashioned folks who still stop by the Shoe. "Sometimes I feel like a VHS among a bunch of DVD's." 10 Myths about the Smuckers--Dispelled! Yes, that title is 92% clickbait. Just having a little fun here. However. I've found that people take what I write/post and draw assumptions. LOTS of assumptions. Also conclusions and surmisings and extrapolations. If you asked, they'd insist that that's what I said, or, at the very least, what I meant or implied. I realize how easy it is to read something and come to conclusions beyond what the author actually stated, but some of these are a long leap from reality. So. Let's set things straight. 1. We are farmers. Yes, Paul and I both come from long lines of salt-of-the-earth, cow-milking, seed-planting, pig-butchering farmers. Our house is surrounded by farms. We have a farm-related business serving a number of farms in the area. But we, ourselves, do not farm. We do not own or rent acres of ryegrass. We don't have tractors or combines. Myth 2. We grow and can/freeze all our own food. Sometimes I have a garden. Sometimes I don't, such as when I know the summer is going to be extra full with travel and caring for my dad, and I know I can only do so much without having a nervous breakdown. Those years, the weeds grow high in the garden patch and I like to think I am being Biblical by giving it a sabbath rest. When I do have a garden, I grow things like radishes, green beans, carrots, corn, cilantro, tomatoes, and lettuce. We can and freeze some of that. We also can and freeze applesauce and grape juice from our own trees and vines, and we get strawberries and cherries and raspberries and peaches from local produce stands. But there's still a LOT of food that I don't grow or put up myself, like Cheerios, turmeric, coconut, chocolate, ice cream, peanut butter, cheese, and olive oil. Myth 3: Our kids are all little kids or teenagers. They used to be, but they grew up. I still use the term "kids" because English doesn't have a good generic term for grownup offspring. "Children" implies "people under 12 years old." Our youngest is 16 years old and graduates from high school in May. Our oldest will soon be 30. Right now I have 4 in college. This fall, I might have 5, and if I can talk Amy into taking a class at North Chiang Mai University just to set a record, I might have all 6 of my kids in college at once. So yeah, they are no longer little whippersnappers shooting at light bulbs with slingshots or playing dolls with their friends. Myth 4: I tell you everything about our lives. Truth: I don't tell you all about our lives. In fact, I don't tell you that much at all. 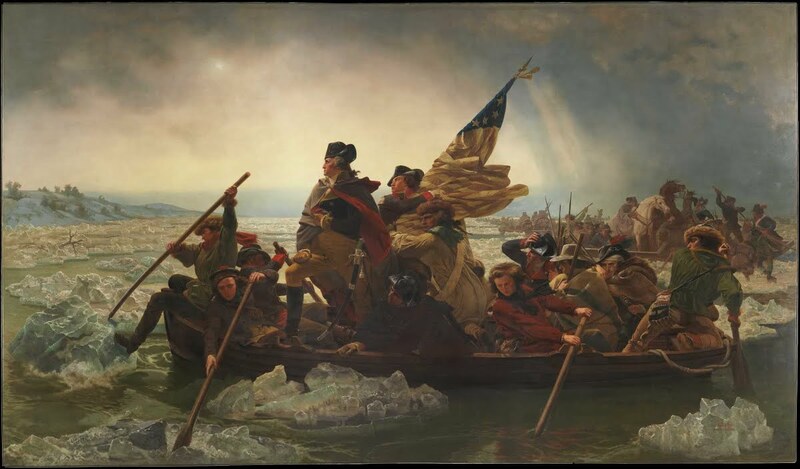 You know the famous painting, Washington Crossing the Delaware? Well, it's 149 by 255 inches [says my friend Wikipedia]. Imagine our family's life as such a painting. There's a lot going on, a lot of figures, lots of color and drama. After all, there are 8 of us plus extended family and everyone else who's in and out of our doors. I write about us once a month in the newspaper. I post on this blog. I post clever snippets on Facebook. Which seems like you're seeing a lot of the painting. The truth is, you're not standing right in front of this painting, examining it in detail. You're either 100 feet away, getting a general* sense of water, winter, boats, and bravery. Or you're up close, looking at it through a soda straw and seeing only a detail here and there--a bit of the flag, a hand on the oar, a flapping coattail. Writing teachers will tell you to say just enough and to let the reader fill in the rest with his/her imagination. Readers are good at filling in with their imagination. But they forget what was actually stated and what was filled in by their own minds. Myth 5: If you tell me anything, I will write about it. Maybe five or ten times in the past, since ideas were panting at the door of my brain and begging to be let out and I was inexperienced and didn't think it through, I have made grievous errors of writing about people who did not want to be written about, without asking them first. Bad things happened to me. Really bad, awful, rather-meet-a-rattlesnake things. Bad enough that I wept, and repented, and lost sleep, and said terrible condemning and castigating messages to myself, and drowned in regret, and wrote great wordy apologies, and decided to quit writing forever because there was no atoning for this error, and no one with such a lack of discretion should be tossing words out into the great world, ever. But always, eventually, between my gentle husband and the even-gentler Holy Spirit, I was re-introduced to Grace and to Calling and to Permission to Make Mistakes, and once again, the words spun in my head until they dropped forth, one by one, with great caution, from my fingers. So now I am very careful. And I ask before I write about you. I even pay you. If you are someone who divulges your latest escapade to Emily and adds, "Please don't tell your mom because she'll write about it," that is painful but no more than I deserve. But believe me when I say I've learned a few things, and sometimes I sit on stories that are like trapped squirming cats, struggling and scratching to be told, but I hold onto them tightly and don't let them free. Myth 6: I had a lovely, mythical, idyllic childhood, because I was Amish. Maybe it's the Amish-novel readers that assume this. When they reference the pain in their own childhoods, they look at me and add, "But you wouldn't know anything about that." I was Amish, but it wasn't a fairy tale. Sorry to shatter that delusion. Myth 7: As a Mennonite woman, I live a life bounded by rules and strictures and pressures from my society. My spontaneous nature longs to be free. I am shackled by a patriarchal system that keeps me from pursuing my dreams and keeps me insulated from the wonderful world that beckons Out There. Seriously, I run into people who talk like this. They look at me worriedly and ask subtle-social-detective questions. They suggest ways I can be Truly Me even among my customs and traditions. They send emails full of hints and questions and bright encouragement. I just smile. This is a myth you can believe, if you want, since it's all about perspective, and I won't try to logic it away. Myth 8: We have a good marriage because we were so lucky to find True Love in Each Other at the Auspicious Moment. Let me just say that if Mr. Blunt Oblivious Type A Practical Healthy Hi-Energy Take-Charge UnEmotional can successfully be married to Miss Dreamy Hinting Subtle Tea-Sipping Easily-Hurt Creative Asthmatic Feelings, then any couple, any where, can make it work. Luck is nice, and we had our share, and we inhabit a good good land, but please don't minimize the mountains we've climbed and the swamps we've waded through to get here. Not everyone can be lucky, but everyone can stick with it and make good, tough, choices and come to a place of green pastures--if they're both committed, which is where the luck comes in. Myth 9: If my kids write, they are "writing like their mother." Emily is the most overt writer and has produced news articles, blog posts, fiction, and a book. Amy and Jenny write poems and occasional insightful and funny blog posts. They all write lots of [I'm sure] amazing literature that never leaves their journals. Matt and Ben write scientific stuff now and then. Matt writes summaries and informational papers at work that are praised for their insight and precision. They write like themselves, all of them. They don't write like their mom, and they don't need to. Myth 10: My children are as nice, beautiful, clever, and amazing as I always say they are. Oh wait, that one is true. Women’s Retreat was at the same house this year, just north of Newport. I slept on the blue pull-out bed with my head lower than my feet because I always forget to sleep in the other direction, and I paid for it with a stiff neck. Rachel was the first one up on Saturday, and she made the first pot of coffee. Breakfast was eggs and ham rolled and baked in tortillas, followed by shopping at the outlet mall in Lincoln City. Again. A few years ago, ­Sharon left her laptop on the ­table, open to her Facebook account, so I posted a silly notice on her behalf that she had lost her dentures. One of the teenage girls back in Harrisburg read it before church (“Oh dear! Poor Sharon!”) and went to Sunday school and shared this concern with the youth girls’ class, and they all prayed earnestly that the teeth would be found, when of course they were in the unsuspecting Sharon’s mouth the whole time. We recalled this and much more in our hours of chatter around the ­living room and sitting in the hot tub, late at night with the stars coming out above us as the storm moved on. Just like always. Then, when my ­social batteries were fully ­re-charg­ed, I was just as happy to go home, where I knew the tea would taste exactly right, the oak tree across the road would stand between me and the pink sky when I raised the shade in the morning, and Paul in his blue recliner would be surrounded by piles of seed-warehouse paperwork and the day’s newspaper. The first daffodil of the season was in a vase on the kitchen counter when I walked in the door. This, too, is a long-standing tradition. How do the ­daffodils know to coordinate their blooming with women’s ­retreat, I wonder, and how does Jenny always remember to have the first one on the counter when I come home? Maybe they both know the magic of tradition, the power of welcome, and the comfort of the familiar. “Do you consider yourself a go-er or a stay-er?” my ­daughter Emily asked me last week, and I didn’t know how to answer. At her age, I was a traveler, moving to Oregon from the Midwest at age 19, living in the wild north of Ontario, Canada, after our marriage, and traveling to Africa and the Middle East and Mexico some years later. My mom, back on the farm in Minnesota, wrote countless letters to her wandering children. The wrens are back at the feeder, she would say. At sewing circle, they quilted the ­Burgoyne Surrounded quilt she pieced for the Mennonite Relief Sale. The deer and pheasants are eating the leftover corn in the fields. Olaf the neighbor stopped in. And the old rooster thinks the one-eared cat is his girlfriend, and they walk around the barn ­together. Hers was a small life, I thought, circumscribed by Dad and the farm and church activities and the weather. She was happy with the coziness of the wood stove, the sewing machine, the whistling teakettle signaling time for a cup of mint tea. Now, like her, I find joy in the cozy and ­familiar. Our son Ben feeds the cats on the porch ­in the morning and laughs at their predictability — Count Olaf ­always launches herself 3 feet up the glass patio door before Ben opens it, and Cinnpurrella runs inside, circles a few chair legs, and runs back out. At church, I can count on the elderly gentleman who tearfully praises my husband’s sermons. Muddy Creek rises with ­winter rains. The neighbors to the south clear brush and burn it when it isn’t raining. Tony at the Harrisburg Pharmacy will always dispense ­kindness along with antibiotics and asthma inhalers. My friend Arlene will assure me that I’m normal, and Rachel will remind me that my children will all be OK.
“Your mother was so content where she was,” a friend of hers told me on a recent visit. She looked a bit wistful, and so did I, because we both knew that, in a strange paradox, Mom’s happiness with her narrow sphere made it possible for her to influence a much wider world, through endless letters to her scattered family and the truckloads of quilts and comforters that warmed faraway grandchildren and people she never knew, through an Amish-Mennonite ministry providing food and blankets to the impoverished in Eastern Europe. And Mom always ­welcomed us home. Sometimes you need to go to exciting places and do amazing things, and sometimes you need to be the solid launch pad that lets someone else take off for far places and great accomplishments. Matt, the Navy engineer, comes home at least twice a year and says that this is the only place where the trees are the right shade of green. He has always wanted to go to Mars. NASA is taking applications for the next batch of astronauts, who may or may not go to Mars, he tells me, and he plans to apply. These grapevines need to be pruned before spring, I think, pushing the tough branches aside to reach for a just-opened daffodil. The camellia bush that nearly froze to death in the cold snap two years ago is miraculously putting out buds just outside my office window. Maybe a mint-oil spray will ­discourage the spiders that always fill the sewing-­room window with cobwebs. As I take care of the details of our lives, I pray for the high school daughter planning an ambitious future. I pray for all my college kids to find their way and for the daughter in Thailand and the firefighting son to be safe. And I pray for the son who wants to go to Mars, that my personal desperate cautions would not keep him on Earth if God’s calling is for him to go elsewhere. Then I wipe out the refrigerator, arrange a bouquet, and am grateful for this vocation of making a place that they all want to come back to because it’s warm and safe and familiar. I thank God that I get to be here, waiting, the ­teakettle whistling, to welcome them home. I think Ben capitulated to this virus first but kept pushing himself to go to college. Then Paul got it. "How are you feeling?" I'd say, and he would go through a disturbing little routine of looking at me with watery eyes and saying Uhhhh? and wiggling his fingers over his head while putting his chin in the air and waving his head from side to side. And now that's exactly how I feel. Very Uhhhhh and very much like something is wrong in my head, besides the usual. So I am lying in bed with a teacup and a thermometer beside me and my head anointed with mint oil, which is supposed to stop headaches, and since I have lots of time to think, I am thinking that it's too bad we only live one lifetime. Because there are so many things you could dedicate a whole lifetime to, and you have only one go. You could buy one of those empty stores in Harrisburg and have a little fabric/paper/tea/thrift shop. Or you could get medical training and work in some underserved part of the world. Or you could design and sew clothes. Or you could have a little farm and grow produce and sheep and chickens and flowers. Or you could be a full-time writer. Or you could have a big family and do lots of cooking and listening. I chose the last one, obviously, and I do bits and pieces of the others, such as writing a little bit and taking out the stitches from someone who didn't feel like going back to the doctor to have his stitches out, except I don't really do the store in Harrisburg, but I sort of scratch that itch by selling a few things on ebay, such as the sewing pattern from 1939 that I bought for 25 cents and that is going for $12.50 with one day left [she bragged humbly]. Lately I've had this misguided grandma craving to make little dresses, so I sewed two of them with no particular little girl in mind. But in between seams I made cheeseburger soup for James H. who had surgery, and washed kitchen counters, and also took two cats in to get fixed, which didn't go so well, because we had signed up Beatrice and Peppermint Patty, but Beatrice the Dumbest Cat Ever disappeared, and the cat carrier wasn't latched right and broke apart halfway out to the car, and there was a blur as a cat disappeared around the camellia bush,and I ended up taking in two cats who were not Beatrice and PP, so I kind of lied, since the vet people were very big on specific names, but this was a program to fix low-income cats and my voucher was going to expire the next day. Emily had just learned in one of her classes that pretty much everyone tells white lies as a way to make society run kindly and smoothly, and she was insistent that she is an exception to this, and so is her whole family. The others in the class felt that if you didn't tell white lies you were blunt and unkind, but Emily says she knows plenty of people who are kind and diplomatic but don't lie. "How does this skirt look on me?" "Well, I think it would look good with that long gray sweater you have." We also note that Smuckers are utterly honest and direct, wandering into "blunt" territory now and then*, but you always know where you stand with them, which I like. I am scrupulously honest most of the time, but I wanted those cats fixed without any more drama or babies. So maybe having a big family is the way to go, because you get at least a taste of all the other lives you'd like to live. I read this cool article the other day about this guy who dressed up for a day in different costumes. He was a security guard for a day, and a mechanic, and a doctor, and a priest. The priest part was especially interesting. I am so used to being in identifiably-religious garb [long skirts, hair in a bun, veil] that I don't give it much thought. But it made me think about the identity and responsibility that a person takes on by looking distinctly religious. There's an expectation of behavior, and honesty, and trustworthiness. And, in the case of the priest, of helpfulness. There's a very American belief that what you wear is your business and yours alone--whatever expresses Who You Are and is comfortable. Other cultures are much more context-oriented (I think that's the word) where clothing carries a message and tells how you fit into society and whether or not you respect yourself and others and the situation you're in. Mennonites are big on clothes and the messages they convey. Like I said, I don't mind the connotations of my clothes, as long as they don't make people nervous and distant. I want them to feel safe, but maybe that's more a matter of the expression in my face than my clothes. I want people to feel that they can ask me for help. I have a feeling we choose our clothes and then our clothes make us take on an identity without us realizing it. My mom always had a manner and voice that she used on "Englisch" people, and another one for Amish and Mennonites, and another for her family. Last Halloween I wrote about how Margaret and I dressed up and went trick-or-treating, and I said it was the only time we did. Well, there was one more time, sort of. I put on a pair of brown corduroy boys' pants--not my brothers'; probably something Mom picked up at the Catholic rummage sale to make comforters--and I think a paper bag over my head, and I went out the back door and over to the front, and knocked. Mom came to the door. "Now who could this be?" she said in her most Englisch-people voice, and it was the strangest experience to be addressed thus. So I pulled off my bag and laughed and laughed. My older sisters, who were in their upper teens at the time, had a friend from a distance come and stay a few days. My brother Jeff and I were, I suppose, about 12 and 13 respectively. We children and this friend went shopping one day and found this curly, chestnut brown lady's wig at a thrift shop which someone in the party gaily purchased. When we got home, Mother was gone and the house was empty, and we decided to dress Jeff up and put the wig on him and all be sitting primly in the front room conversing politely with this "stranger" when Mother walked in. So they had Jeff put on one of my dresses, and they put this wig on him and we were all splitting laughing because he looked for all the world like a girl, or a lady...it was sort of hard to place exactly what he looked like. And then Mother drove in the lane, and fast and furiously, we straightened up and took our places demurely, and began to act like "company", which was utterly unnatural altogether..
And she walked into the front room from the entrance hall of that old farmhouse and there we were all sitting properly, and here was this stranger....but no one offered any introduction or explanation. She looked around, trying briefly to assess the situation, when suddenly the stranger rolled onto the rug into the middle of the room in a wild giggling fit, and all the rest of us just sat there and watched her giggle. Till we all just lost it and he snatched the wig off.. Afterward Mother said it was the oddest feeling ever, because there were these curiously familiar aspects, (Jeff was famously giggly at that specific point in his life) and yet there were not any other pieces to the puzzle that fit in anywhere.. I said her mom must have felt like she fell into a time warp or something, with this stranger laughing on her carpet. Rhonda said, "She laughed heartily and VERY SATISFYINGLY when the truth came out so it was all worth it." It is approaching suppertime and I am going to let the family fend for themselves, seeing as how there is baked chicken in the fridge, and leftover cheeseburger soup, and quesadilla materials, because everyone in the family is capable of fixing themselves a plate of decent food from materials on hand. I am not nostalgic at all for the days when I didn't get to just go be sick when I was sick, and if I didn't fix them something they pretty much didn't eat, and hungry little Amy scattered a bag of chips like snow all over the bedroom floor and I lay desolate and vomitous on the bed in the middle of the mess. I don't miss that part of those days at all. But I do miss the little people. Jenny: I like it when Dad buys you flowers. It shows that you love each other. Not that I don't already know you love each other! And it's not loud like kissing.